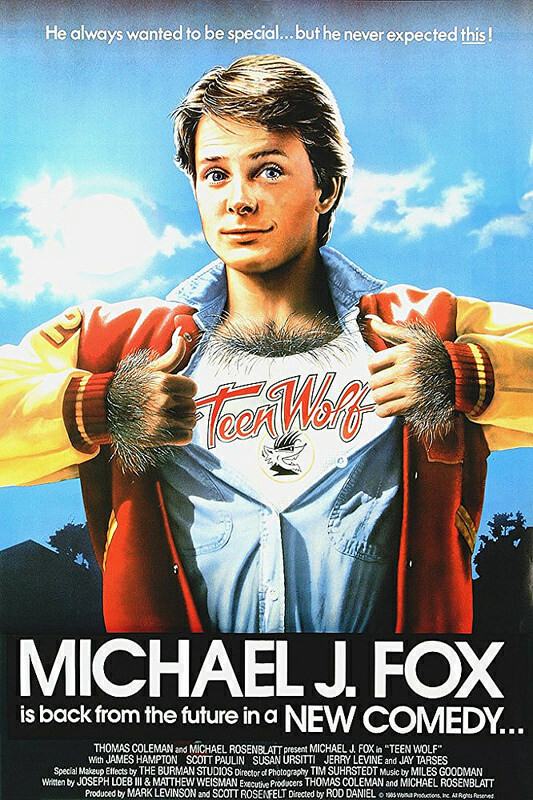 It’s time for a teen party film by the name of Teen Wolf. These guys seem to party more than they actually attend class so it makes sense why they are all bad influences on each other. It’s definitely a pretty interesting take on the whole Werewolf genre and I’d actually say that it is handled better than most. It is a lot different than I was expecting it to be at any rate based on the fact that the TV probably chose the worst poster for it. It suffers from quite a few issues, but not any of the Werewolf ones. Instead, it suffers from the issues a teenage party film usually runs into. I guess if it’s not one thing then it’s the other right? So, the film starts off by showing us how Scott is a lot like Peter Parker. He isn’t very good at sports. In fact, his team never wins a single game. He’s definitely not very popular and Scott just feels like things never go his way. The popular girl in school won’t even talk to him, but in this case it’s Scott who is being obnoxious since he knows she is taken, but acts like that doesn’t even matter. Well, things all change one day when he begins turning into a Werewolf. Now he can finally become the popular guy he always wanted to be, but it may end up coming at the cost of his old friends. Is it worth the popularity? The film even seems to recognize the similarities to Spider-Man as they reference the “With great power comes great responsibility” line and it’s Scott’s father who tells him this. His mother also may have been murdered by the school bully as he mentions in passing that he’s dealt with Scott’s kind before and how he got the Mom with a shotgun. This could just be classic bully posturing and he got a normal wolf, but the Mom never actually appears so it’s up in the air. I wouldn’t even say it’s all that implied though so it’s a bit of a stretch. You could also say that the film’s moral dilemma is similar to the huge Bayonetta controversy going on right now. You could pay 5.99 to start winning thousands of dollars through tournies and get popular, but you may alienate your old friends as they struggle to keep up with the freemium characters. As your ego grows larger and the friendships grow smaller, it gets tricky. I have to give the film huge kudos for having a big plot twist that I actually didn’t expect. Naturally Scott is going through a tough time and his Dad wants to help him. At this point, Scott is in full wolf man mode so if he opens the door then his secret is out. However, if he doesn’t then his Dad’s gonna bust the door open. So, Scott opens the door and you expect him to have transformed back to normal in typical cliche fashion. Instead, he is still a werewolf and what’s more..his Dad is a werewolf too. He takes it very commonly and that was probably the best scene in the film. From here on out his Dad probably should have taught him more about being a werewolf whether Scott was ready to hear it or not, but it was still a cool twist even if the film doesn’t do a whole lot with it. I also like how the Basketball team completely accepts him instead of everyone suddenly turning on Scott. He’s the same guy after all so why should they start fearing him? They shouldn’t suddenly call the cops and start attacking him or anything. Realistically, he’s just another one of the guys, but with super strength and speed now. It made the Basketball scenes even more hype even if he became a ball hog. I don’t buy into Scott not actually realizing why everyone was getting upset at him to be honest since he made it obvious that his friends weren’t needed, but it was still cool. The basketball scenes actually had a lot more screen time and focus than I had originally thought they would. The final game is super cheesy since the team is up against the champs and all, but it’s still a fun ending. I got some Air Bud flashbacks during this. If the film had stuck to the Basketball plot along with the Werewolf part then this film would have actually been quite solid. Unfortunately, it does get hurt quite a bit by the romance plot as well as the various party scenes. The first party is incredibly long and definitely doesn’t do the film any favors. It’s basically just everyone acting super obnoxious and playing Spin The Bottle sort of games. Scott’s friend Boof is always trying for him, but he’s trying for someone else leading to one of those annoying triangles. Boof is able to corner Scott in the closet and as with most film leads he doesn’t mind relenting at this point, but he’ll still go after the other girl next. It’s just a very sad case of rebounding since Scott ditches Boof like last year’s pizzeria and immediately goes for the other girl even after she had been mean to him the whole time. After the girl uses Scott and then dumps him, he comes crying back to Boof. This isn’t a good romance since Boof was Scott’s backup pick and she should have been the one to reject him this time. Scott isn’t even a good character so it’s not like you can root for him. The romance scenes make this painfully apparent. Then he lets his ego control him for all of his Werewolf scenes and can’t control his urges much either. I think that just about anyone would have done a better job of using his powers. He also is willing to buy some beer even though he is underage. At least he said no to the gun, but it still wasn’t a good move. His friend Stiles is the perfect example of a bad influence as he loves to break the rules in every possible way. He isn’t lacking in confidence which makes him charismatic, but also dangerous. His only redeemable quality is that he’s loyal to Scott at least. He cheered along with everyone else when Scott finally scored and it was a pretty hype moment. They didn’t care about standing out, just supporting Scott. The Principal is an interesting antagonist although his role isn’t all that big. He just has a big grudge against Scott since he had issues with Scott’s father. That would probably make for a decently interesting prequel but since we already know the ending, maybe it’s best to let that lie. The principal, well I guess he was technically the vice principal, (but then where was the principal?) may have lost but he put on a good show. Even if Boof probably made the wrong call in sticking with Scott despite the main character not being loyal, she’s still a good character at least. While I doubt she’s much better than the other teenagers as she was still at the party, at least she isn’t completely off the rails. Surprisingly, the few scenes we see of school aren’t that bad. I did enjoy the montage of Scott getting knocked out during class since they kept referencing Wolves many times. He handled it pretty well for the most part and even when he ran to the rest room he showed great speed and only slipped a few times on the way. The visual humor of how long the hallway was worked pretty well and this scene also showed how perceptive the vice principal was as he almost caught Scott. It also showed us how one of the friends from the early part of the film really was fake since he got scared off so easily. Finally, I should give a quick shoutout to the basketball coach. He was definitely great as he hit Scott with the hard truth. He always kept it real and said what was on his mind. Even when the other students turned their backs on Scott, the teacher stayed firm. As long as he had his snacks and got 12 hours of sleep he was close content. At the end of the day that was all he needed and really was a great coach. He is easily the best character in the film and any scene with him in it tends to be pretty hype. Overall, Teen Wolf is better than I thought it’d be. The humor isn’t bad and the Basketball scenes are really good. It’s just the dreadful party scenes that don’t help matters and Scott is a very poor lead. You can’t feel bad for him because as the Dad mentioned, he dug these holes on his own. Going out with the girl who was only using him was probably the worst part of that. It’s not really a film that I’d recommend, but I can see why it’s well liked. The two best aspects of the film, Basketball team accepting Scott and the father being a Werewolfs were extremely well handled and were really unexpected. It’s not everyday that a film can pull off something that is unexpected while also being good. That alone is enough to keep this film afloat even if it can’t get any higher than that. I think that what we have learned here is that if you want to be a good Werewolf film then you also need to try and be a good sports film. That’s the ticket to victory. This entry was posted in Live Action Movie Reviews, Live Action Movies, Reviews and tagged Back To The Future, Basketball, Comedy, Film Review, Michael J. Fox, Movie Review, Review, Romance, Sports, Supernatural, Teen Wolf by dreager1. Bookmark the permalink.